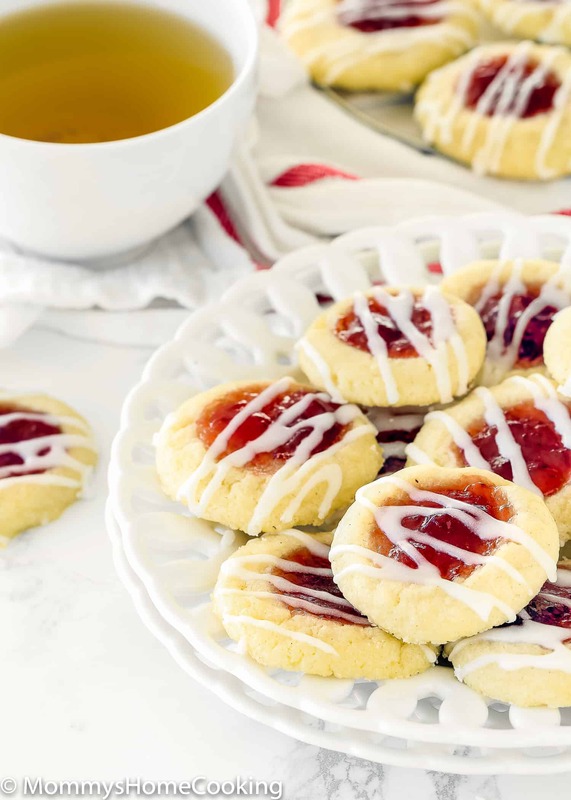 These Eggless Thumbprint Cookies are a wonderful treat for this holiday season! They are gorgeous, delicious, and guaranteed show stoppers at any holiday party. Sharing is highly recommended. 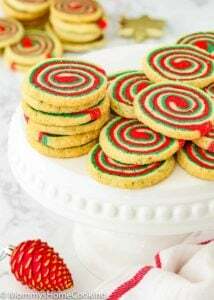 Ring in the holidays with these Eggless Thumbprint Cookies! 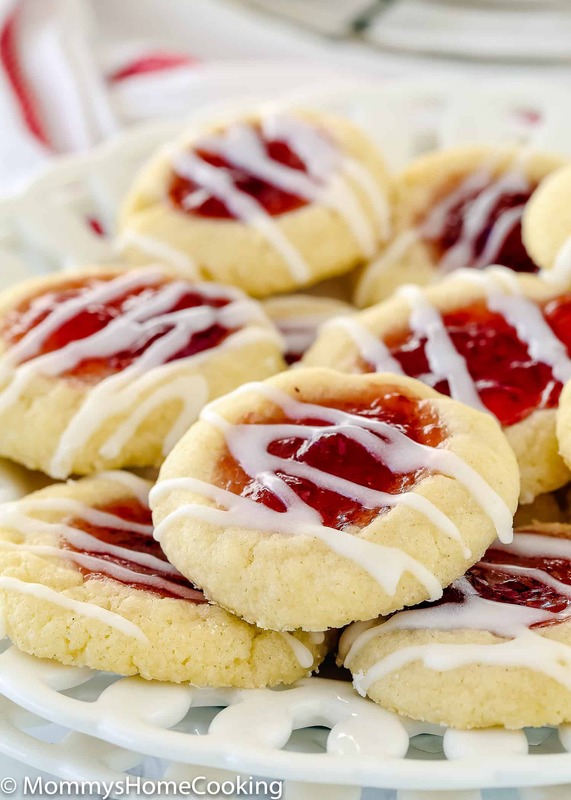 these buttery cookies and bright strawberry jam will match perfectly with your holiday spread. Perfect for company, a holiday snack or cookie swap. I cannot tell you how much my kids (and I) loves cookies! 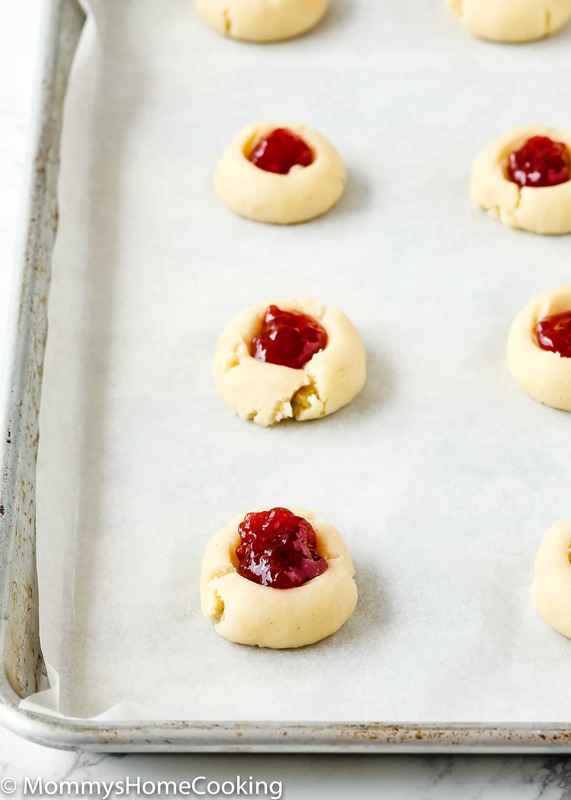 They don’t just love to eat but to make them too, and these Eggless Thumbprint Cookies are so easy and fun to make that my children can help me prepare them. Since this will be our first Holiday season in our new neighborhood I am planning to pilgrimage around with plates of cookies. After all, Cookies are basically the point of Christmas, right? just kidding…kind of. 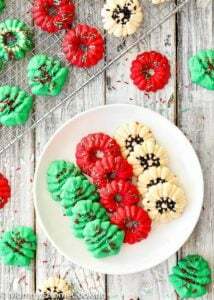 Even though, December hasn’t started yet, we have already done dark chocolate cookies, chocolate chip cookies, molasses cookies, sugar cookies, and these Eggless Thumbprint Cookies. Of course, none of these batches of cookies will make it to our new neighbors’ hands. 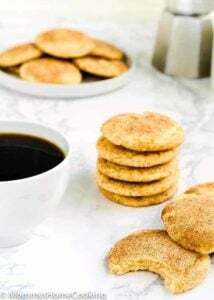 They are long gone, but I had the chance to test and try new eggless cookies recipes. Serve these succulent Eggless Thumbprint Cookies out with after-dinner coffee and/or tea and they’ll disappear in no time! 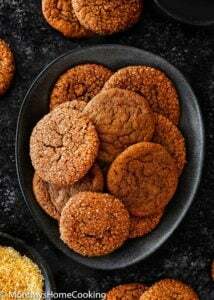 When it comes to cookie recipes, I only have one rule: They have to be mouthwateringly good and yet incredibly simple to make. 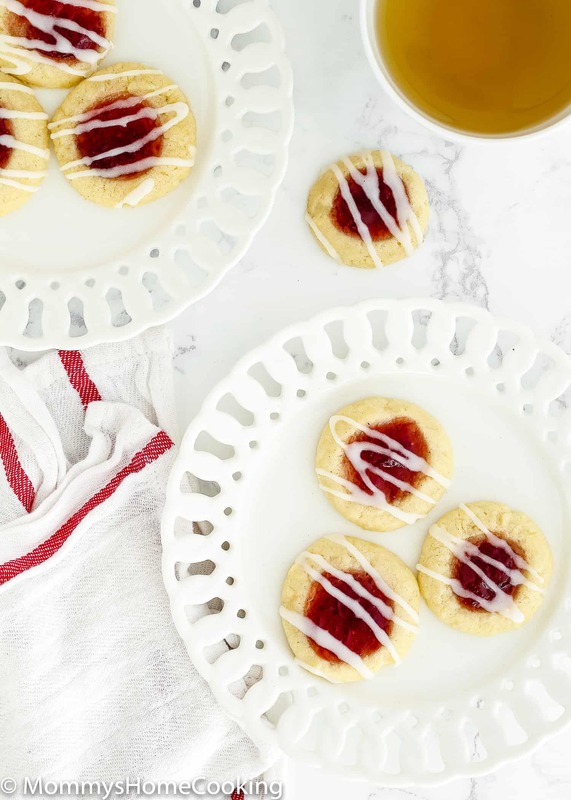 These Eggless Thumbprint Cookies fit the bill! 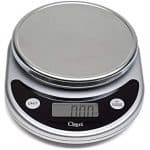 Measure: Use a scale to measure out your ingredients. 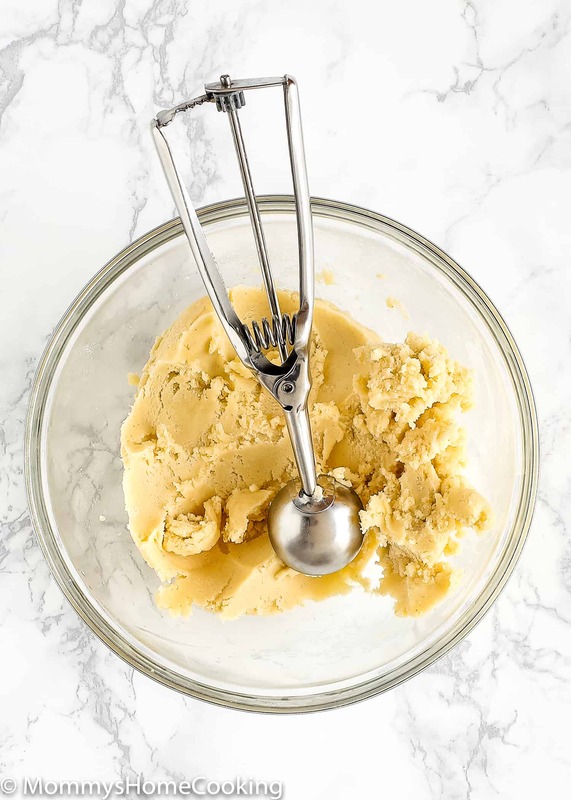 Chill the Cookie Dough: Chilling cookie dough helps prevent spreading. 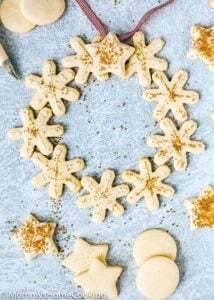 The colder the dough, the less the cookies are likely to over-spread. Secret ingredient: Adding a couple of tablespoons of cornstarch will help prevent excess spreading. Filling: If the jam/preserve is too firm, place it in a small microwave-safe bowl. Heat briefly (about 5-10 seconds) or until jam is not hot but is no longer firm and is easy to stir. Don’t care too much about the baking time! The reason for this is because every oven is different, so the cookies are done when the edges are set and lightly browned. 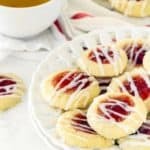 Jam/preserve: any jam or preserve will work fantastic for these cookies, from strawberry to lingonberry and everything in between. White Chocolate-Peppermint: melt the chopped white chocolate in the microwave in 20-second increments, stirring after each until completely melted. Add a few drops of peppermint extract. Fill each indentation and let it set before serving. Dark Chocolate and hazelnuts: melt the chopped dark chocolate in the microwave in 20-second increments, stirring after each until completely melted. Add chopped hazelnuts. Fill each indentation and let it set before serving. White Chocolate + Crushed Pistachios: melt the chopped white chocolate in the microwave in 20-second increments, stirring after each until completely melted. Add chopped pistachios. Fill each indentation and let it set before serving. Dulce de Leche + Coconut: After the cookies are cool, fill each indentation with dulce de leche. Sprinkle with shredded coconut (unsweetened). 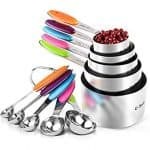 Milk Chocolate and M&M: melt the chopped milk chocolate in the microwave in 20-second increments, stirring after each until completely melted. Fill each indentation with melted chocolate and add the M&M on top. Let it set before serving. In a large bowl, whisk together flour, cornstarch and salt. 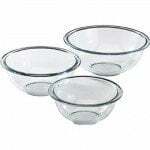 In another bowl, beat butter and sugar, scraping bowl often, until creamy, pale and fluffy, about 5- 7 minutes. Add vanilla; mix to incorporate. Then add dry ingredients in two batches and continue beating at low speed, scraping bowl often, until well mixed. Fill each indentation to the brim with jam, about ¼ - 1/3 teaspoon each. Before baking, make sure they are 2-inch apart. Bake for 14-16 minutes, or until edges are lightly browned. Let stand 1 minute on cookie sheets; remove to cooling rack. Combine all glaze ingredients in a bowl with whisk until smooth. Drizzle over cookies. If the jam is too firm, place your jam in a small microwave-safe bowl. Heat briefly (about 5-10 seconds) or until jam is not hot but is no longer firm and is easy to stir. If you don't have enough space in your refrigerator to cool the cookies in two baking sheets, you can place all the cookies in one baking sheet to cool. 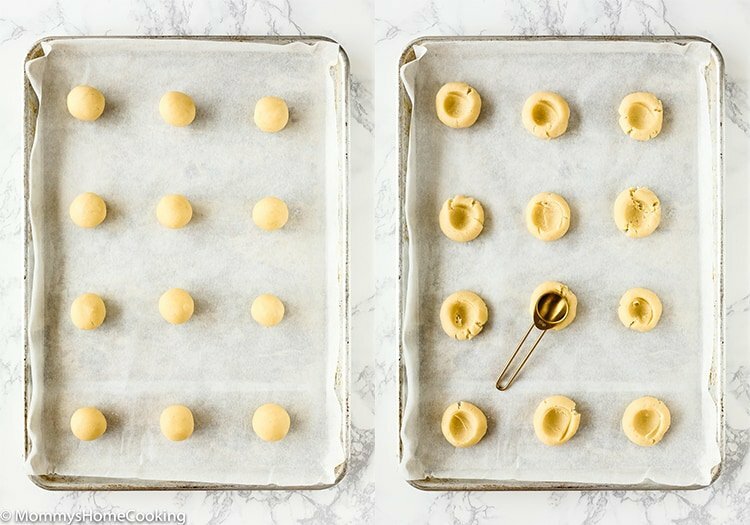 After the cooling time is over, distribute the cookies in two baking sheets making sure they are 2-inch apart. Dear Oriana, I tried your recipe for making Thumbnail Cookies. They turned out wonderful. 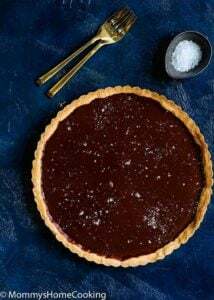 I had used blueberry preserve on some and strawberry chocolate on others. 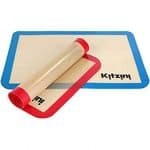 My family loved them. Thank you and regards from India, Brototi Das Gupta. Hello Brototi! Thanks for trying this recipe. I’m so glad you enjoyed it!! !